Now entering Gravity Pool Three Thousand and Six. Necessary adjustments to navigation systems in progress; expect some delay. The Mermaid’s audio interface sounded alone and eerie in the empty cockpit of the ship. Wandering, the tin-toned voice echoed down an oil-stained, aluminum-lined corridor and out into the cargo bay. Once there, it buzzed in the air for a hope-filled second, and finally died. Bazar-Tek, who served the small, rattling ship as Captain, pilot, and all the rest of the crew, looked up as the last echoes of the automated message faded. The ship was silent, and Tek grimaced at the patch of grease. It had been transfigured, if not removed, by his efforts, and now existed as a large and somewhat ungainly smudge. He rolled up his now-stained sleeve and shrugged, patting the ship’s wall. The words found no traction in the overlarge room, reverberating slightly before drifting into the all-consuming white noise of the ship. The cargo bay was a wide, rattling, drafty place where the gravity always seemed slightly off and the air always smelled a little sour, with a strong overtone of acidic lemon-scented cleaning spray. With a rumble and a whuff, the heating set in. Dust swirled in the air, and Tek coughed, waving a hand. Complication adjusting navigation systems, the voice informed. Please wait. “I’ll complicate your navigation systems,” Tek grumbled, without malice. The Mermaid had taken a laser blast from an Imperial ship on their last job; hearty creature that she was, the blast hadn’t stopped her from sailing–though it had given the main computer’s mapping function a nasty habit of stalling for hours on end whenever they crossed the border into a new gravity pool. Tek brushed the dust from his shirt. “That won’t work for another two hours, at least. Why don’t you just take a nap?” he suggested, glancing up at the expressionless overhead speaker. The ship didn’t respond, and Tek gave a noncommittal shrug. It would be days, at least, before that they reached the next planet in Galaxy One–Thirty-Nine Blue. A new planet–new enough that the Imperial soldiers wouldn’t know his face. A planet hopefully lax or corrupt enough to allow him to unload his new merchandise, exchange it for food and fuel towards his next foray into the unknown. The unknown. The phrase ran through his mind oddly, demanding resolution, and he wondered for a second where he’d go next, what he’d do. Perhaps he’d find a fat and unusually defenseless Trader–or perhaps he’d fulfill the outlaw’s dream, the victimless crime of robbing a Taxer. Stealing taxes had a heroic ring to it. Tek snorted, shaking his head. Heroic. He couldn’t lie, not even to himself, to pretend that he was a hero. There were none, in this business–or in any business. ‘Hero’ was a character in a child’s dream, not a job title. In any case, wondering about the future were as out of place as heroism. Handle one job at a time, live from take to take, and don’t think too much–that was a plan. In the general interest of Not Thinking, Tek pulled himself upright, setting latent muscle to half-petrified bones to make his way towards the center of the rattling room. The floor was pleasantly, livingly uneven under his feet. Scuffed and ill-used, it was patched over with such a mottling of metals as to seem like a mad scientist’s attempt at creating skin for a mechanical tortoiseshell cat. One of the more extravagantly repaired sections, however, had never needed the work. Crafted of a thicker gauge of steel than any part of the rest of the ship, a single square of flooring in the exact middle of the room had been patched out of art, and not necessity. It blent unwaveringly in with the rest of the floor–Tek scuffed over it, searchingly, twice before he finally recognized it. “The day I find this door without missing it is the day I retire,” he muttered to no one in particular, kneeling to feel along the edges of the square of metal. The ship responded in uncharacteristic silence, the panel sliding open to reveal a deep, musty-scented hold stuffed with recent acquisitions. The crates and bundles, Tek had expected; but his shoulders stiffened nonetheless, and he looked down, unable to take his eyes from the one item he had not expected. White-haired and thin-limbed, he looked far too ancient to be settled as comfortably as he was atop the hard-edged crates. For a moment, Tek could only stare; and while he was staring, the man shifted, eyes fluttering in response to the sudden light. He sniffed, blinked, and sat up, eyes alighting on Tek’s face. He smiled, and his face took on the appearance of crumpled cloth–annoyingly unsurprised cloth, at that. Following his own advice, the stowaway leapt out the hold with impossible energy, and stepped forward to shake Tek’s hand. Too shocked to speak, Tek limply allowed his hand to be grasped and shook. The stranger spun away, examining the drafty, dusty, oil-stained bay with a skeptical eye. “Hold on,” Tek managed through his surprise, but the stowaway interrupted him. Tek followed the man’s wild gesture to a leaking coolant line, and scowled. There was a growling tone in Tek’s voice that made the stranger halt, looking at Tek with raised brows. Taking in the stranger’s appearance–the torn and oddly stained robes, the outdated and yet deadly holo-sword that hung inactive at his belt–Tek shook his head, and in his curiosity, forgot to sound threatening. “What are you?” he asked. 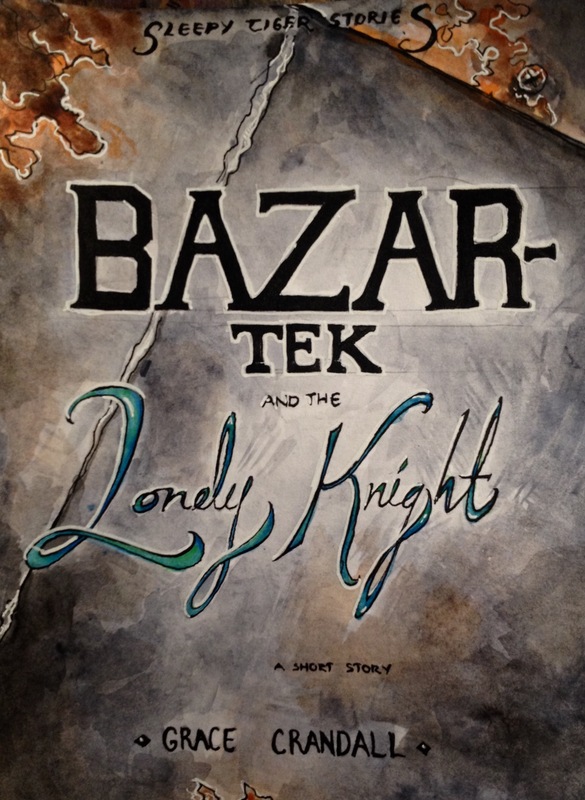 If the outlandish, ancient figure had declared itself to be a figment of imagination, a living illustration from a child’s storybook, or a ghost, Tek would not have been surprised. Instead, the man only smiled, a wide, crumpled-cloth smile that, like the rest of him, seemed too boisterous, too large and too alive in the dull, dust-and-acid air of the cargo bay. Systems reloading, the Mermaid informed in her usual light and mechanical tone. Please wait. The heaters, their work done for the moment, shut off with a reluctant, rumbling whirr. Tek blinked, looking at the stranger, who merely smiled back, calm and assured as though he had listed off any other real and quantifiable profession. “Right. A hero,” Tek said, finding himself unreasonably rankled–not at the man’s intrusion on his ship, or at his manner once there, but at those last, still faintly echoing words. “A hero,” Ezra confirmed, factual and unrepentant. Tek huffed. He was cut off by a sudden, rending crack that rocked the ship and almost threw him to his knees. Ezra looked up curiously, somehow keeping his footing through the assault. With a jolt of panic, Tek realized what the sound had been–the laser cannons of a Lawship signaling the Mermaid to a halt. He took rapid stock of the situation–the open smuggler’s hold, the stranger blinking at the ceiling with an odd brand of resignation. “Into the hold!” Tek shouted. “Now, before they access the security feeds.” If, by some wild chance, they hadn’t accessed them yet. Ezra looked at him for a wide-eyed second before doing as he was bid, and as the camouflaged panel slid silently into place once more and Tek tried to still the fear rising in his chest, a deep and unfamiliar voice–entirely unlike the Mermaid’s–began to boom through the speakers. If the lawship had witnessed Ezra clambering wildly for the hold, or seen the hold itself filled with Empire-stamped goods, the voice over the speaker gave no sign, but they were surely watching now. Wearing a plastered-on smile, Tek saluted the nearest camera and the eyes who watched him behind it before making his way to the cockpit. “He looks like a brigand to me,” Captain Vargus remarked, watching the figure on the grainy feed from the little trade ship’s cameras. His second, Patrol Officer Kohn, sat beside him in the over-wide, over white comm chamber with characteristic dignity–or perhaps characteristic pretension–and said nothing. Vargus scowled askance at him, but did not lower himself to speak. The Marksman’s patrol had been a long and exceedingly dull affair, and as he watched the Mermaid’s captain muddle about in her ratty cockpit, he half-wished that the man would turn out to be a pirate or a naer-do-well and lead them along a merry chase–but his luck had not improved since the day he’d been assigned this particular mission, it seemed. The trade ship slowed to a juddering halt, and Vargus sighed. In the center of the room, the hologram from the ugly little junk-ship began to flicker to life, stuttering as if it had a bad connection. The figure of a hulkish, shortish man showed for a moment in hazy tones of grey before fading to uncertain static. A clang and a curse came through the speakers, and the hologram became whole–grainy and low-quality, but whole. The figure it showed was a young, tattooed vagabond of a man. “How can I help you gentlemen, then?” he said, attempting to sound genial while speaking through his teeth. He failed. “Officer Kohn and Captain Vargus to you, space-crawler,” Kohn barked. He was not attempting to sound genial, and his resounding success at it almost startled Vargus from his seat. “And Captain Tek, to both of you,” the hologram said scowlingly, shifting on its feet. “Hem. Yes,” Vargus coughed again, realized that coughing was doing little to aid the situation, and resigned himself to pretend that the last few awkward minutes had not occurred. He drew himself up in dignity. “We have halted you, Captain Tek, to inquire if you know the whereabouts of this man.” He gestured to the screen behind his chair, flicking the desired image onto it with a simple twiddle of his fingers. “He’s a dangerous lunatic and an egregious criminal. Perhaps you’ve seen him?” Vargus recited hopefully. If he never had to repeat those words again after today, it would not be too soon. The vagabond squinted at the picture for a moment, then shook his head. “Calls himself the ‘Lonely Knight’?” the captain quested again, more in half-hearted hope than suspicion. Heart pounding, Tek kept up his careful expression of indifference. The face of Ezra Kote stared unblinkingly from the screen behind the ship captain’s head, and Tek glanced at it again without the slightest hint of recognition. The captain looked at the first officer, then shrugged–and with a flash of relief, Tek realized that they believed him. They were going to let him go, and at this point it was in his best interests to end the call and send them on their way as quickly as he could. The captain blinked as Tek cursed himself. Curiosity–stupid, stupid curiosity–but too late to take back the question now. Captain Vargus shrugged, then began to tap through his control screen. A picture of the missing girl flashed across the screen. She couldn’t have been older than thirteen. The Captain looked outraged even mentioning such evils. Unbidden, a laugh began to rise in Tek’s throat, taking considerable effort to choke down again. The screen-bound captain scowled at him, unconvinced. Still unconvinced, the captain nodded. He reached out to tap the control screen once again. Before Tek could finish, the screen went a dull and uniform shade of greenish-black, and the rumble of engines announced that the Marksman was making its Imperial way elsewhere. Relieved, Tek slumped against the wall of the comm chamber. The world was full, it seemed, of grease and grime and laws and stolen things. These, Tek was used to. But, if the lawmen could be believed–and, if Tek was honest, there had been no reason for them to lie–it seemed that sometimes, there were heroes as well. One, at least. In the face of that fact, the grease and grime seemed monumentally less important. With a sharp intake of breath, Tek got to his feet. The Marksman would be far enough away now to have severed their connection to his security feeds–and he needed to retrieve something from the hold. “Then, of course, I chopped off the villain’s head!” Ezra announced, waving his holo-sword in a dangerous arc through the air and very nearly missing both Mermaid’s control panel and her captain. Used to Ezra’s embellishments, Tek ducked expertly, and came up again with raised brows. With another swift gesture, Ezra shut off the sword, replacing it in his belt. Tek leaned back again, taking in the story. Ezra cracked his shoulders, rising to his feet. Ezra left, and Tek used the few free minutes he could depend upon before the arrival of another story to glance at the ship’s map and check on the status of their journey. He glanced, glanced again, frowned–and finally looked out the window. Thirty-Nine Blue, which had been a small but slowly growing dot of golden-brown in the far distance for some days now, loomed now, large and not distant at all. The nearest surface was dark, going through its night cycle, and the white-glowing sun was invisible save for the halo it cast around the eclipsing planet. By the time they were landing, it would be dawn. “Tea!” Ezra exclaimed, reentering the cockpit. Silent, Tek gestured to the window, and the old man went still. The Mermaid rattled loosely, complaining in rusted creaks and groans as she settled on the landing pad. The thrusters stirred up a golden whirlwind of loose sand, which swirled wildly in the planet’s wind-whipped air as the ship whirred to a reluctant halt. With a final hiss and clank, the ship settled, and Tek took his hands from the controls with the cautious, expansive gesture of someone who had just set down the last in a long line of standing dominoes. The ship remained silent, steady, and he breathed a satisfied sigh. Tek allowed himself a smile. He followed Ezra to the airlock. It eased open with a rusty creak, revealing the planet’s dry and desolate surface, complete with an even drier and more desolate town in the far distance. Ezra walked to the edge of the ship’s ramp, and halted before setting his feet to the planet’s soil. Tek frowned, all but blinded by the planet’s sun-soaked surface. “You’re certain you want to stay here?” he asked, looking at that heat-maddened mass of dead sand and seeing nothing worth loving. Ezra looked out too, blinking into the overwhelming light as though he could see beyond it. “Not stay,” he said, some of the usual buoyancy going out of hid voice, if only for a moment. “I never stay. I’ll move on, eventually. But–look at this place, my friend. Have you ever seen such purity, such cleanliness? It is as though the sun has absolved this place of sin. There is glory here, I’m certain of it–and I will find it, before I leave.” His eyes were almost glowing with purpose, and Tek nodded, for a moment swept away in the mere ferocity of Ezra’s words. But as the robed figure stalked away into the unbearable white of reflected sunlight, Tek felt a swift stab of something else. The Lonely Knight was a hero, he had ceased to have any doubts about that. But for all the people he came across, all those he had helped, none came back to him; and when he fought, he fought alone. Captain Tek of the Mermaid stared at the switchboard of his inactive ship, blinking blandly at the dead screens and deflated gauges, and pondered loneliness. From loneliness, he found himself thinking of life as a whole. There were so many souls he did not know, so many planets he had not seen, so much life that drifted out in the great expanse of living dark that at times seemed all there was, and sometimes seemed to promise–more. There seemed a vast abyss of things that needed doing, and Tek was compelled to go and do them. He closed his eyes, possibilities drifting through his mind. Perhaps he would even do something…heroic. I have a ton more. Why don’t you take one of these for a spin?